The price of the 25.91 metre motor yacht _Impossible Dream, _listed for sale by Jonathan Chapman at Northrop & Johnson, has been reduced by $100,000. Built in steel and aluminium by Dutch yard Jongert, Impossible Dream was delivered in 1986 with a full refit in 2007. Accommodation is for up to 11 guests in four cabins consisting of a master suite, a twin to port with a Pullman berth, a double to starboard with an upper single berth and a VIP suite aft with a separate entrance via the cockpit. The saloon has exquisite sapele wood panelling throughout and has a sofa, table and chairs to port while to starboard there is a bar with a fridge, liquor locker and storage. There is also a concealed plasma television set and a complete entertainment centre. Up on the flybridge, outdoor entertaining and dining are catered for with a couch, chairs, sun pads and a table while a Bimini top provides shade over the helm station. Twin 250hp Caterpillar engines give her a cruising speed of nine knots and a transoceanic range. The major refit in 2007 of this yacht for sale included a full redesign of the interior spaces along with the galley moved to the main deck, a VIP cabin and media room added, and the aft deck extended. Finally, the engine room was gutted and redesigned with new generators. 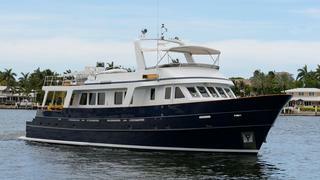 Yacht for sale Impossible Dream is lying in Fort Lauderdale, Florida, now asking $1,695,000.